ERIE, Pa. – Through four games, Miami has beaten the teams it should’ve beaten and lost to the team ranked in the top five of the national polls. The RedHawks sit at 3-1 two weeks into the season, having swept Alabama-Huntsville twice at home and shut out Mercyhurst in the third-place game of the Ice Breaker on Saturday. Their blemish is a 4-0 loss to No. 5 Providence in Friday’s semifinal round here. Miami outscored UAH and Mercyhurst, 12-1, an encouraging sign that the RedHawks have blown out those teams since MU has 11 new players on its roster. And really Miami played better than the final score indicated in the loss to the Friars. Considering how the RedHawks’ off-season began, this quote-unquote rebuild could’ve been a whole lot worse. Miami will get plenty of true litmus tests against teams of its caliber, but its start has been encouraging. — 6-feet-7 defenseman Andrew Sinard made his collegiate debut on Saturday, and he handled his start well. He was listed as the seventh defenseman on Miami’s lineup card and appeared cool when the puck ended up on his stick while holding his own on D.
He threaded a pass to Jonathan Gruden that nearly resulted in a goal as well. — Sinard and Chaz Switzer made their 2018-19 debuts on Saturday as Miami dressed seven defensemen. River Rymsha sat for the first time this season. Switzer was banged up in preseason but logged 55 games his freshman and sophomore campaigns. — After this weekend, eight blueliners have dressed in four games – Grant Hutton, Alec Mahalak, Rourke Russell, Brayden Crowder, Derek Daschke, Rymsha, Switzer and Sinard. The first five have skated in all four games, Rymsha has played in three games, Switzer and Sinard made their 2018-19 debuts on Saturday. The fact Miami has trouble getting some of these guys in the lineup speaks to its depth. — Karch Bachman leads the team with three goals, including a breakaway tally and eventual game winner in the first minute on Saturday. He forfeited some of his gold star when he took a spearing major and was assessed a game misconduct in the second period, but the Florida Panthers draftee has clearly found another gear early this season. Finishing chances was an issue at times in 2017-18 but his shooting percentage is .200 in a small sample size this season. — So playing the Canadian and U.S. anthems prior to games is apparently a thing for Mercyhurst, so we heard both each night at Erie Insurance Arena. — Somehow missed this in the off-season but teams are allowed to dress a 19th skater this season. On Saturday it was Sinard, on Friday it was forward Noah Jordan. 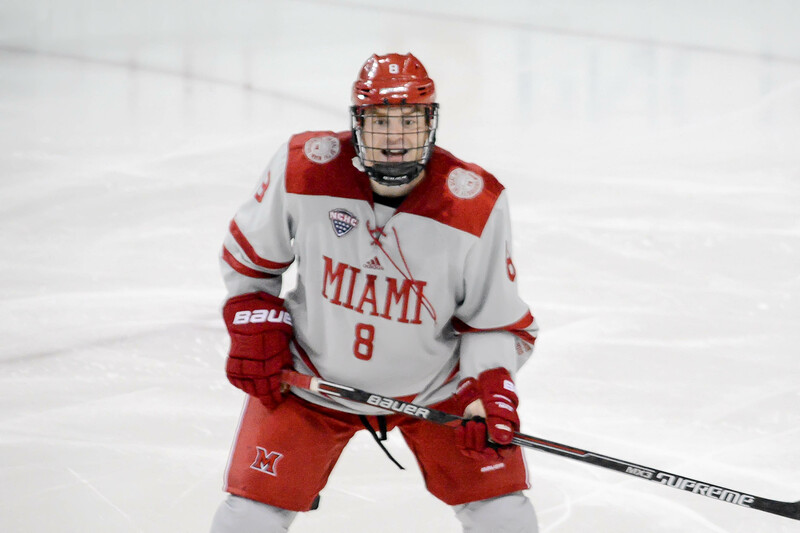 That was extremely helpful for Miami on Saturday since Bachman was sent to the dressing room early, and the RedHawks also benefitted in their opener when Carter Johnson was cheap-shotted. — If there was a penalty killing first star for the weekend, it would go to Brian Hawkinson. The freshman is proving himself quite an agitator and is earning tons of PK time with his defensive ability. — Attendance was listed at 2,387 for Saturday, but there were fewer than 500 for each of Miami’s games, including the third-place game against Mercyhurst, which is located in Erie. As many MU grads as there are living in Cleveland and Pittsburgh, there should’ve been more RedHawks fans in the seats. WHO: Miami RedHawks (2-0) vs. No. 5 Providence Friars (1-0). WHEN: Friday – 4 p.m.; Saturday – vs. Notre Dame/Mercyhurst 4 p.m./7:30 p.m.
WHERE: Erie Insurance Arena, Erie, Pa. ALL-TIME SERIES: Providence leads, 9-5-3. NOTES: Miami dominated Alabama-Huntsville in a home sweep to open its season last weekend, but the RedHawks will face at least one top five team as they participate in their first Ice Breaker since 2006. MU will face either host Mercyhurst or No. 2 Notre Dame on Saturday, depending on the outcome in the openers. The last time the RedHawks participated in an Ice Breaker was the weekend Cady Arena opened in October 2006. Miami finished second that weekend, beating Denver but falling to Vermont. The RedHawks and Providence have frequently met in October the past few seasons, but typically on one of the teams’ campuses. The last time they met at a neutral site was the first round of the NCAA Tournament in 2015 when PC won 7-5 in Providence at a game hosted by Brown. Hayden Hawkey was in net for all 24 Providence wins last season and is already 1-0 in 2018-19. He posted a 2.04 goals-against average and a .919 save percentage as he seeks his 50th career collegiate victory. He is one of 17 returning members of the Friars, who have added three NHL draft picks including their fourth-ever first-round pick in Philadelphia Flyers selection forward Jay O’Brien. Providence lost its top two points-producers from 2017-18 but has four of its double-digit goal scorers back, including Kasper Bjorkqvist, who tied for the team lead with 16 last season. Josh Wilkins potted 15 and tallied 31 points, Scott Conway scored 13 times and is 1-1-2 already in 2018-19, and Vimal Sukumaran finished with 10 markers. PC swept Miami last October at Cady Arena and beat American University, 3-1 in this season’s opener. Notre Dame is seeing its first regular season action this weekend, and Mercyhurst dropped an 8-2 decision vs. Bowling Green in its lone game last weekend.